This game-changing research graced the cover of Chemical Science. Results: In an unprecedented find, a research team including scientists from Pacific Northwest National Laboratory discovered that the three electronic and electrochemical properties having to do with the energy necessary for electrons and molecules to assemble or break apart are not always correlated. This lack of correlation is unexpected and suggests possible explanations for observed differences in organofluorine materials. These popular materials are composed of carbon and fluoride; uses include photovoltaic devices, which turn sunlight into electricity. 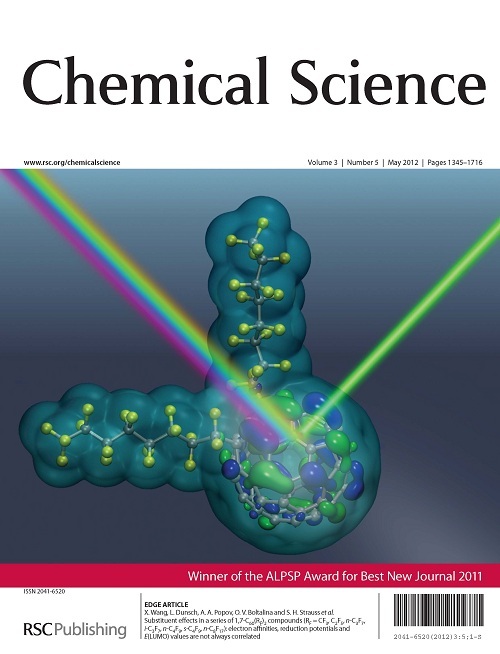 The research graced the May 2012 cover of Chemical Science. "It surprised us that for this series of compounds, there is no correlation," said Dr. Xue-Bin Wang, a scientist at PNNL who previously held a joint appointment with the Laboratory and Washington State University. "This research has changed the conventional wisdom." Why It Matters: The grand challenge is to make materials that efficiently capture sunlight and generate electricity. This research is providing fundamental knowledge about the relationship between electronic properties and molecular structure of materials that could be used in solar cells. Further, this new understanding can help scientists design materials with specialized electronic, optical, magnetic, or other properties. Methods: Previously, it was thought that simple linear equations related three electronic and electrochemical properties. However, the equations did not always predict the outcomes seen in the laboratory. Scientists in the United States and Germany collaborated to determine the relationship between the properties. Researchers at Colorado State University synthesized seven different—yet structurally similar—organofluorine compounds. Each compound has a different carbon-fluorine group attached to a buckyball—a special arrangement of carbon atoms shaped like a soccer ball. The team investigated the electronic and electrochemical properties of each compound using spectroscopic, computational, and electrochemical methods. The team at Colorado State measured the electrochemical properties of each compound in the solution phase. At Argonne National Laboratory, they used the Advanced Photon Source to characterize the critical structure for one of the seven compounds. At PNNL, researchers measured the electrochemical properties of each compound in the gas phase using photoelectron spectroscopy, located in EMSL. Construction of this spectrometer was wholly funded by DOE's Office of Basic Energy Sciences. "The research team came to us because we had this unique capability," said Wang. "We are continuing to collaborate with them because of the capabilities at EMSL." The German institutes, Dresden University of Technology and Liebniz Institute for Solid State and Materials Research, completed advanced computational studies and density functional theory calculations to elucidate the behavior of the electrons. The researchers found that electron affinities, reduction potentials, and E(LUMO) values are not always correlated. What's Next: The researchers are now working to determine how electron affinity changes when solvent molecules are attached to the organofluorine compounds in the gas phase. Sponsors: The research was supported by the U.S. Department of Energy (DOE), Office of Basic Energy Sciences, Chemical Sciences, Geosciences, and Biosciences Division, the National Science Foundation, the Colorado State University Research Foundation, a PNNL alternate sponsored fellowship, the AvH Foundation, the Erasmus Mundus Program External Co-operation, and the Electrochemical Society. The Computational Center at Moscow State University, and the Center for Information Services and High-Performance Computing at TU Dresden provided computer time. User Facility: EMSL and Advanced Photon Source. Research Team: Igor V. Kuvychko, James B. Whitaker, Bryon W. Larson, Travis C. Folsom, Natalia B. Shustova, Olga V. Boltalina, and Steven H. Strauss, Colorado State University; Stanislav M. Avdoshenko, Dresden University of Technology; Yu-Sheng Chen, University of Chicago; Hui Wen and Xue-Bin Wang, Washington State University and Pacific Northwest National Laboratory; Lothar Dunsch and Alexey A. Popov, Liebniz Institute for Solid State and Materials Research. Reference: Kuvychko IV, JB Whitaker, BW Larson, TC Folsom, NB Shustova, SM Avdoshenko, Y Chen, H Wen, X Wang, L Dunsch, AA Popov, OV Boltalina, and SH Strauss. 2012. "Substituent Effects in a Series of 1,7-C60(RF)2 Compounds (RF = CF3, C2F5, n-C3F7, i-C3F7, n-C4F9, s-C4F9, n-C8F17): Electron Affinities, Reduction Potentials and E(LUMO) Values Are Not Always Correlated." Chemical Science 3(5):1399-1407. DOI:10.1039/c2sc01133f.